As there hasn't been one of these recently I thought I'd make one. Usual scoring system applies, with 50 points for any incorrect answers. Please send answers using PMs before midnight on 17th August (two weeks from now). 1. Name an operator which has New Routemasters in its fleet. 2. Pick one of the three heritage liveries carried by New Routemasters. 3. Name a New Routemaster operated route which previously ran with customer assistants. 4. 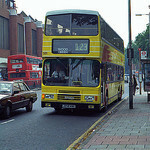 Name a type of bus which has been used by CT Plus on route 388. 5. Name an operator which purchased new Volvo Citybuses for use on London routes. 6. Name an Arriva garage which currently has VLAs allocated. 7. Pick any (as built) variant of the original Routemaster. 8. Name a type of body built on the Dart SLF. 9. Now name a body built on the step entrance version of the Dart. 10. Name a double deck chassis built by Dennis. 11. Name a TfL route which serves Hatton Cross. 12. Choose a route which is currently operated from Harrow Weald garage. 13. Name a TfL route which has either (officially) fully converted to electric buses or has been announced as converting in the future. 14. Name a Stagecoach London garage which is north of the Thames. 15. Plan a journey from Edgware to Waterloo using a maximum of three buses (daytime routes only, and not using any other modes of transport). Thanks for organisaing, I'll PM you when I have had time to think. Could you confirm what you mean by "Waterloo". Is it the station so just York Rd / Waterloo Road or is Westminster Bridge Rd (back of Waterloo) also valid? Just the stops which serve the station. Sorry that wasn't clear, I suppose I just don't tend to think of the Westminster Bridge Road area as being part of Waterloo even though some of the station's platforms reach that far. Thanks. That rules out a number of possibilities. Interesting quiz - I'll have a stab at this! Eight entries have been received so far. I've also decided to keep this open until the end of Sunday to give anyone who might have missed it a bit more time to answer. I should then be able to post the results shortly afterwards. The full answers and results are below. Really good quiz astock5000 , decent range of questions. Well done twobellstogo for winning! I thought I was being clever on a couple of them - not realising LondonLinks would be lumped in with L&C. Likewise with the Caetano Slimbus, which has been counted under Nimbus. It's as much gamble going for really obvious answers like Pointers for the Darts as it is going for obscure stuff, but that adds to the fun of it. Question 15 was interesting, never thought of doing one like that. Wonder how many variants there are if it was limited to two routes - guess the 113, 221 or 240 would be the only options to start with? I couldn't find any evidence of Citybuses being delivered new to LondonLinks, so thought I was being generous by counting it as London & Country. As for the Slimbus, I tend to find the use of that name isn't consistent (the same goes for several types and operators and in general I went with the names I would normally use (hence Enviro400 / Olympus and not Trident / Olympus, Enviro400H and not E40H / Enviro400, etc). Another thing to mention here is that I counted the Leyland prototype Routemasters as separate variants (due to them originally having their own codes) but RM1/2 simply as prototypes for the standard RM. In the end no one went for any of those but in some cases it's impossible to explain how some things will be counted without giving away the obscure answers, which then makes choosing them more risky. I also like the format of these quizzes as to whether to pick the obscure answers or hope that most others know them and go with the more obvious, hoping they haven't had the same thought. Looking at questions 9, 13 and to some extent 7 and 8 too, it appears the obscure answers were more popular this time. I briefly considered only allowing two routes for question 15 but thought that wouldn't give enough possibilities. However as it was there were many more than I realised, I had about eight listed and less than half were actually given as answers. A few were similar, for example anything via Victoria then has the 211 or 507 option. 221, 141, 26 or 76 - Other than this, most of the easterly options didn't occur to me. It was certainly interesting to see what everyone came up with, especially as I'm not always as knowledgeable about routes as I am with the buses which operate them. In fact a few of those answers have given me some ideas for future bus journeys! Anyway I'm glad the question worked well, despite it not affecting the result of the quiz. I suppose the trick would be to estimate the number of people taking part and then work out a journey that has an appropriate number of options, though that would require a good knowledge of the route network and plenty of time to check for all possible answers, whereas Edgware and Waterloo were simply the first two places which came into my head! It was a excellent quiz and thanks for organising this quiz astock5000. Well thanks very much indeed astock5000 and big well done to twobellstogo . As you'll recall in my PM Mr. astock5000, I never expected to win by a long way, though I'm amazed got on to the eighth place bracket and not the tenth one , was a great bit of fun and thanks again for hosting and thanks to the members who took part. I am completely fascinated by the answers to no15. A few in there that never dawned on me which I find interesting. I wonder how much the answers are just how people's brains work relative to the knowledge they have and how much they are researched, clever answers designed to avoid the "obvious" answers.